Seventeen years ago, Tom Himelick, a faculty member in the Emory School of Medicine Physician Assistant (PA) Program took a handful of Emory students to Miss Katie’s General Store in Lake Park, Ga. He wanted to bring medical care to those who needed it in rural Georgia, so he organized this small group of student volunteers and publicized the free health care clinic to local farm workers. The group waited eagerly to see if anyone would show up. By the end of that day, 150 people had come to receive care, and a transformative program—the South Georgia Farmworker Health Project—was born. Working with limited resources to treat a large number of people, students learn a tremendous amount. On the practical level, they depend on—and hone—their physical exam and history-taking skills instead of relying on labs and x-rays. More broadly they learn about health needs and opportunities in rural Georgia. They learn how it feels to make a tangible difference in someone’s life. Having found and filled a great need, the program has grown, attracting farmworkers, student volunteers, and local support. Today approximately 100 student volunteers—90 percent of students in the PA program—care for more than 1,800 people in rural Georgia every year. Supervised by Emory faculty members, students diagnose and treat back, skin, and eye problems; infections; and chronic diseases such as diabetes and high blood pressure. Many of their patients have never before received health care. The clinics are held for two weeks during the tomato, cucumber, bell pepper, and cantaloupe season in June. Students care for farmworkers in Valdosta for one week and in Bainbridge for the second week. A second clinic, held over a weekend in October, was added ten years ago. As the project has grown, it has attracted student volunteers from Emory School of Medicine, the Division of Physical Therapy, the Department of Family and Preventative Medicine (which houses the PA program), and residents from Grady and Emory University Hospitals. Students from nearby schools—Valdosta State University and Bainbridge College—now join Emory students. Turbes first learned of the farmworkers project when she interviewed for Emory’s PA program. When she was offered a spot in the incoming class, the project made the difference in her decision to accept. She took the first opportunity to participate in the fall of her first year and volunteered again for the June session in her second year. The scene looks something like this: the volunteers set up the clinic in the fields before the farmworkers begin their labor. Each volunteer has brought two chairs—one for herself or himself and one for the patient. Facing her patient, Turbes is surrounded by pairs of PA student-volunteers and patients. The clinic has one mobile van where more discreet exams can take place and a table set up as a makeshift pharmacy. Outside the clinic walls, far from specialists, lab tests, and imaging equipment, Turbes focuses on the patients in front of her. She must rely solely on listening to her patients—getting their medical histories—and physical exams to diagnose them. She provides treatment and educates patients about the dangers of dehydration and how to prevent it, the signs of a heart attack, and how to protect themselves from infectious diseases. Inspired by the experience, Turbes became a physician assistant at the Yakima Valley Farmworkers Clinic in Washington. 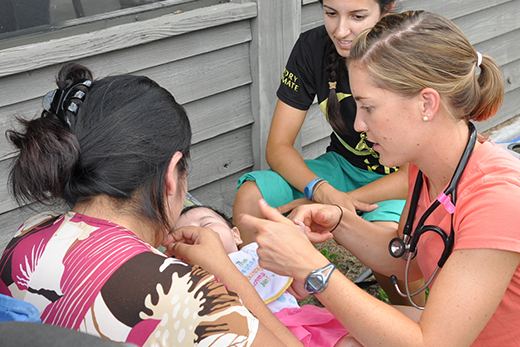 The South Georgia Farmworker Health Project operates with few resources. Students raise money for the project by hosting car washes, selling candy, and organizing a fun run. Support from local institutions also has been a key part of the project’s growth and success. Leaders from local churches such as the First Baptist Church in Valdosta help feed the volunteers, and local growers allow the students to provide care on their land. Local clinics and supporters help advertise the free clinics. To support the program, please contact Stacia Brown at 404.727.9030 or stacia.brown@emory.edu.